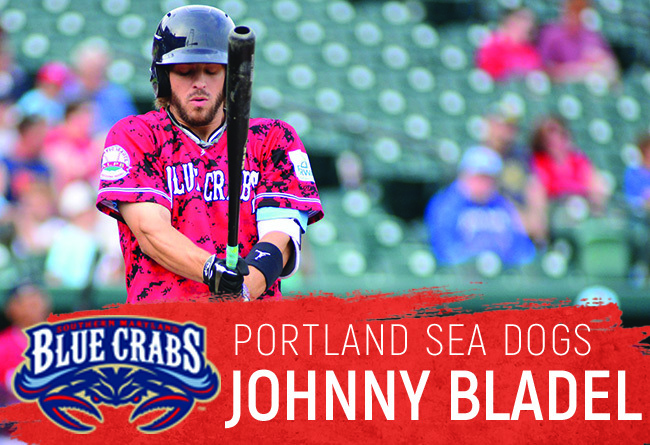 (Waldorf, Md., June 9, 2018) – The Southern Maryland Blue Crabs announced Saturday that Johnny Bladel has been signed by the Boston Red Sox organization. Bladel will report to the Double-A affiliate Portland Sea Dogs. The Virginia native joined the Blue Crabs this season for his first in the Atlantic League. Bladel was named a starter on the Opening Day team, playing right field and batting ninth. The utilityman made the most of his starting opportunity, jumping out of the gates to hit over .400 for the first three weeks of the year. Bladel ranks sixth in the Atlantic League in batting average currently and fifth in on-base percentage. Bladel went undrafted out of James Madison University, signing with the Trinidad Triggers of the Pecos League. He burst onto the professional scene, hitting .518 in 48 games with the Triggers and being signed by the American Association’s Amarillo Sox. Bladel spent the last three seasons in the Canadian-American Association, including the last two with the New Jersey Jackals. In 2017, he led the league in hits, runs, stolen bases, doubles, triples, and finished second with a .345 batting average.